Can’t make it to the 16th hole at the Waste Management Phoenix Open this year? Well, the PGA Tour has you covered. For the first time, fans can experience TPC Scottsdale’s most electric attraction in full virtual reality and 360-video by using a multitude of platforms including Twitter, Samsung Gear VR and Google Daydream, among others. The Phoenix Open marks the fourth event televised in virtual reality and 360-video by the PGA Tour, and the first this year. 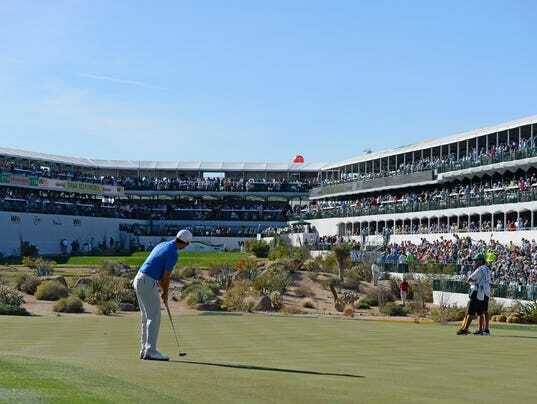 Chris Wandell, the senior director of media and business development for the tour, said it was a no-brainer to include the Phoenix Open’s fabled 16th hole on its VR schedule this year. “The Waste Management Phoenix Open marks our fourth event and we’re doing four days of virtual reality and 360-video coverage,” Wandell said. “We did three last season, and the first one was at the Players’ Championship at TPC Sawgrass in May. Wandell said the experience is intended for both the fan at home and the fan in attendance, and he pointed to unique holes like the 17th at TPC Sawgrass and the 16th at TPC Scottsdale as evidence. “For example, at the Players’ Championship, (the 17th hole) is an island green surrounded by water,” Wandell said. “So the closest any fan is to that green is probably 40 or 50 yards, but we put a camera in the water about 10 feet from the green. According to Wandell, the PGA Tour will be distributing a few thousand cardboard VR devices to several hospitality arenas and will also be handing out a few hundred to general admission sections throughout the course. Wandell said because the 16th hole is such a hot ticket and unique atmosphere, the tour wanted to use its new virtual reality platform to elevate the fan experience to another level. “When there’s 16,000 people at one golf hole, that’s insane,” Wandell said. “That’s the size of a college basketball stadium, and it’s a unique place on our tour. … We wanted to capture the uniqueness of Number 16 and how crazy the fans are. So we’re going to have a few cameras that are almost in the crowd and one camera behind the green that is right next to the general admission section. Wandell maintained that the virtual reality and 360-video experience isn’t to replace the TV broadcast or in-person experience, but rather serve as a supplement to them and go further deep than where the fan is currently able. “The 16th hole is a hard ticket to get,” Wandell said. “Not every general admission ticket holder can just walk in there. You’ll either have to wait in a long line or buy an expensive hospitality package. So if you don’t want to wait in line or spend a bunch of money, this is a unique way to experience the drama of the hole. While fans were slow to embrace the VR glasses being distributed around the 16th on Thursday, those who did were excited with what they saw. “My first perspective of it, I was blown away. I think it’s an introductory phase of it, and I think it can be really cool once they finalize it. I think it’s a really cool idea,” said Mark Van, who was watching from the Skybox on the 16th. Van, who works in the golf industry, felt that even when he was already that close to the action, the virtual reality added a layer. For some others, the cardboard headsets were unique to sample, but quickly put aside in favor of the golf at hand. The virtual reality and 360-video broadcast is part of the PGA Tour’s partnership with Intel and Intel True VR technology, but a VR headset is not required to view the 360-video portion of the experience. To view the 360-video broadcast, fans only need to follow @PGATOUR on Twitter to place themselves at the 16th hole during live coverage of each round from Thursday through Sunday. For those with a virtual reality headset, a separate app must be downloaded onto a VR-capable phone based on the provider. Samsung users will need to download the PGA Tour VR Live app from the Oculus Store and use that phone in a Samsung Gear VR headset. As it relates to iPhone users, one can access the eight-camera VR broadcast through the PGA Tour app available via the App Store and subsequently view it using any iPhone-compatible VR device. The Phoenix Open will be the first event using an app designed specifically for Google Daydream, and users will have to download the PGA Tour VR Live app from the Google Play Store onto a VR-enabled phone and use the Google Daydream device.